In this post we will discuss how to create an app catalog site in SharePoint 2013 using SharePoint 2013 central administration. 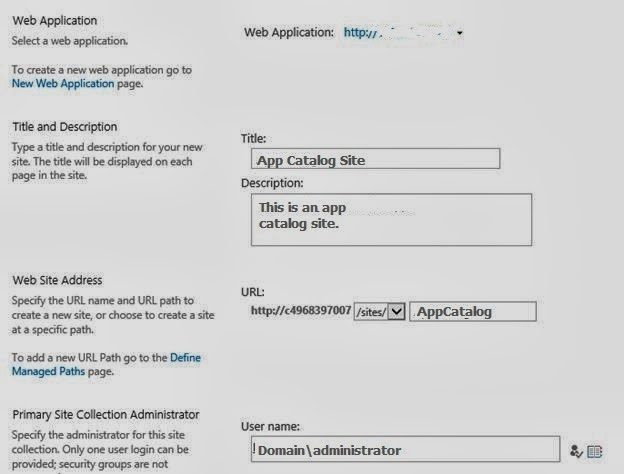 We can create an app catalog site by using SharePoint 2013 central administration. You must have farm administrator permissions within an on-premises farm to create an app catalog site. - Open SharePoint 2013 central administration (Start > All Programs > Microsoft SharePoint 2013 Products > SharePoint 2013 Central Administration). - Then choose Apps from the left hand side and this will open the Apps page. - There click on Manage App Catalog from the App Management section in the Apps page. - Then the app catalog site will be created successfully.